Hurricane Hector whirled toward Hawaii Tuesday with 130 mph winds, bringing the threat of dangerous sea swells on two islands in the US archipelago state. The Category Four storm was expected to pass about 100-150 miles (60-100 km) south of the Big Island on Wednesday, government forecasters said. Swells kicked up by Hector are expected to reach shores of the Big Island and Maui late Tuesday, "likely becoming large and dangerous starting early Wednesday morning, and continuing through Wednesday afternoon," the Central Pacific Hurricane Center in Honolulu said. Off the coast of Mexico, meanwhile, Hurricane John lumbered toward the Baja California peninsula as a Category Two storm. It is expected to generate swells with potential for life-threatening surf on the coasts of southwestern Mexico and Baja California, the National Hurricane Center said. 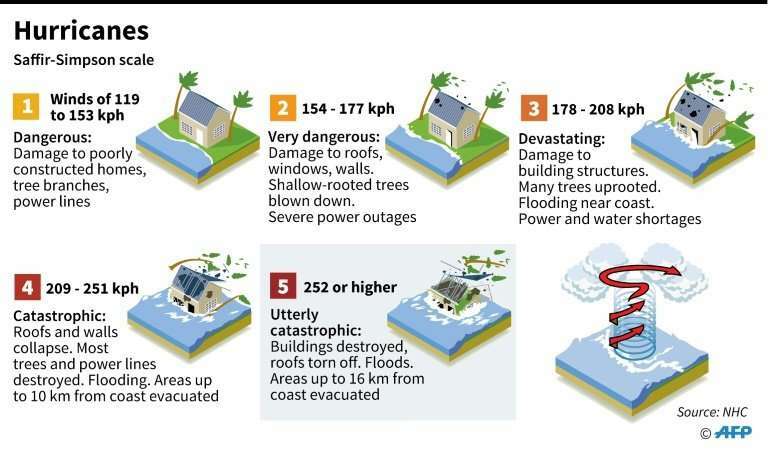 On the five-point Saffir-Simpson scale, a Category Five storm is the most dangerous, with winds exceeding 156 miles per hour (251 kph). John, which absorbed a tropical storm called Ileana, is already dumping heavy rain on states in western Mexico, the National Water Commission said. It urged the general public and ship crews to be on the lookout for strong rains, wind and high waves. Authorities in the Baja California resort of Los Cabos placed red flags on beaches in expectation of waves up to five meters high, said Carlos Alfredo Godinez Leon, a civil protection official. All ports in Los Cabos were closed.